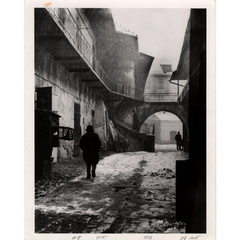 Source of Materials: Roman Vishniac Archive, International Center of Photography. This digital archive of Roman Vishniac’s photographs will preserve the complete collection of his work and increase its accessibility for researchers. The digital archive will consist of Vishniac’s photographs of Jewish ghettos in Eastern Europe during the interwar period, his studio portraits from the 1940s, his microscopic images of cells, insects, and animals, and photographic portraits of Vishniac created by other artists. The International Center of Photography (ICP) seeks a grant of $(will be filled in tomorrow) from the National Endowment for the Humanities to construct the digital archive of Roman Vishniac’s work that will preserve the complete collection of his photographs and increase their accessibility for researchers. The digital archive primarily will include Vishniac’s renowned photographs of Jewish ghettos in Eastern Europe taken between 1935-1938. The collection is also comprised of Vishniac’s studio portraits from the 1940s (most famous are his portraits of Einstein and Chagall), his landscape scenes of America in the 1940s, his microscopic images of cells, insects, and animals from the 1950s and 1960s, and photographic portraits of Vishniac created by other artists. The collection will be significant to scholars and researchers interested in Eastern European history, Jewish studies, memory studies, documentary photography, art history, visual culture, and intersections between science and art. ICP currently holds a third of Vishniac’s photographs, and has been working closely with his daughter Mara Vishniac Kohn (who owns the copyright to his materials) to collect and recatalog all available Vishniac material in order to create the comprehensive digital archive of approximately 8,000 photographs. ICP has imposed a recall on all Vishniac prints and has borrowed photographs from his family estate, the Howard Greenberg Gallery, other museums in America and Europe, and private collectors. Through re-creating the archive of Vishniac's entire body of work, numerous negatives, contact sheets, moving film footage, and thousands of unpublished prints have resurfaced, in addition to personal correspondences and ephemera. In 2012 this project will culminate with the formation of a digital archive that will be publicly accessible through the web in addition to a major traveling retrospective of Roman Vishniac’s work that will open at ICP. This unique opportunity to create a complete archive of Vishniac’s work has great promise for historians and those interested in art history who wish to understand his oeuvre, his artistic intentions, biography, his trajectory and chronology. It will also abet research on the role of the Jewish Joint Distribution Committee, which commissioned a great deal of his work, and the many ways his photographs and subsequent publications have contributed to post-Holocaust collective memory. Historians and scholars of Jewish studies may be especially interested in the documentation of Eastern Europe during the interwar years and the shtetl culture that was obliterated by the Holocaust. Funds from NEH would be invested solely in the digitization of the collection, the construction of a database to record the metadata for each photograph, and towards the design and implementation of the website to make the photographs publicly available. This is imperative so that the records of the photographs that will be returned to his daughter and other organizations will be preserved for future researchers. The website will promote further research of the materials by providing a discussion forum that will allow scholars and others who have special insight on the subject matter in the images to contribute their knowledge. The archive will develop a blog that will be updated on a weekly basis to display highlights from the collection and recent scholarship of his work. The digital archive will also be part of ICP’s website, and will be publicized on site and on the websites of the Howard Greenberg Gallery and museums that have contributed to the Vishniac collection, ARTSTOR, and Jewish archives and repositories internationally.